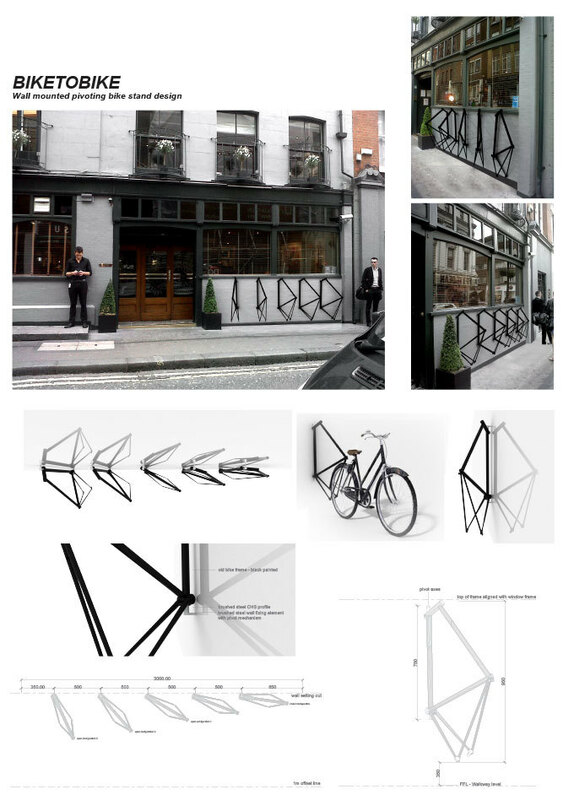 The Groucho Club, a cool private club for media hipsters, had a competition for a bicycle stand. 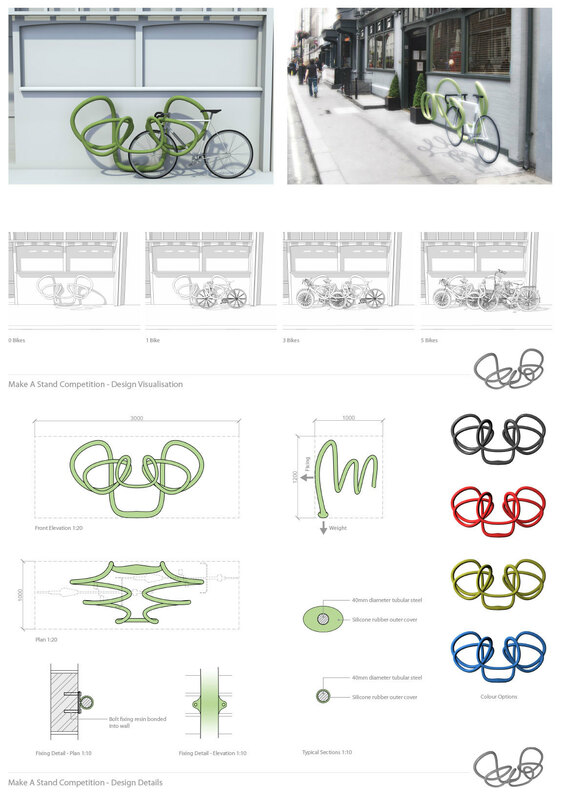 Called "Make a Stand", the competition called for submissions to "develop an exemplary object of industrial design" which could provide secure parking for five bikes within a budget of £1500 ($ 2,300). An important aspect of the shortlisted designed was efficient use of materials and durability: both essential in a big city. The winners would be distinctive and "able to blend into the urban landscape with minimal visual or spatial intervention." The winner, designed by an architect, was this delightful spaghetti-like creation. It was praised for "a playful yet functional solution which was in tune to the values of the member’s club." Made of tubular steel with a silicone rubber cover, it can hold up to 5 bicycles. The runner up was designed by an architecture student. He explains its make-up: "It was made of re-bars which are (normally) used for reinforcing poured concrete. To connect all the bars, a mechanically spliced connection is used (this is basically like a bolt and nut threaded system) that screws two re-bars together. " Also shortlisted was this design made of recycled bike frames painted black. It is wall mounted and pivoting from the wall so is compact and inobtrusive when not in use. There were 68 entries. Since the winner would receive a free dinner and night at the members-only club (why not a job instead, or a membership in the club! ), there was a fun incentive. This is what a bicycle stand for a cool private club looks like.